You’ve heard of “Random Acts of Kindness,” right? Sure you have. We’re even guessing you’ve committed one. Maybe even two or 75. And we’re guessing you’ve also heard of pie. Just a shot in the dark there. 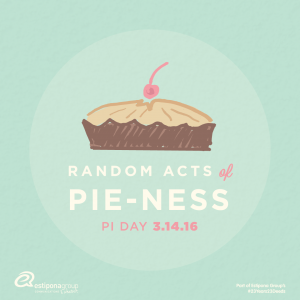 Anyhow, we at the Estipona Group decided it was time for a mash-up of epic proportions for this year’s “Pi” Day on 3.14.16: What if “Random Acts of Kindness” met “Pie”? Anyhow, we asked; you delivered. 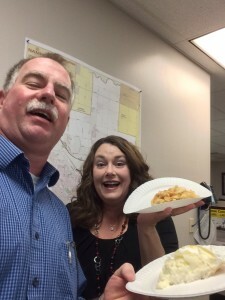 Our goal was for you to buy or bake a pie and deliver it to a deserving person. We even made this shamelessly creepy video promoting the event (with its “this is how NOT to deliver a pie, because it makes the hair on the back of your neck stand on end” kinda vibe). You watched. You baked (or bought). You gave. We heard tale of pies delivered to senior centers. Pies delivered to friends. Pies delivered to unsuspecting, possibly Facebooking co-workers. Many pies were made, bought and/or consumed on Pi(e) Day. And while some of them may have been made, bought and/or consumed without specific homage to our Random Acts of Pie-ness directive, we’re just glad you did it. So we at the Estipona Group have a simple message to send: Thank you. Thank you for watching. Thank you for participating. Thank you for not chasing after people enjoying a nice Midtown jog with a mincemeat pie in hand. See? Wordplay. It makes us giddy. Click here for more details about #23Years23Deeds. Go ahead. We double dog dare you.